This Wallowa Lake cabin will provide you with a family-friendly atmosphere because of its location on the Flying Arrow Resort grounds and is within view of the Wallowa River. The Living room has an electric fireplace, the bathroom has a shower, and the kitchen is well-equipped. It's an easy walk to all of the Wallowa lake activities including go carts, horseback riding, hiking trails, restaurants, and more! 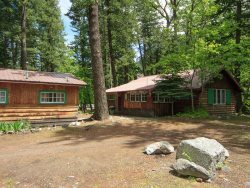 This cabin is great for a small family or multiple families, as it is located near cabins 101, 103-112, Minnow, and Fawn. Come explore the Eagle Cap Wilderness with your family and enjoy all that Wallowa Lake has to offer!